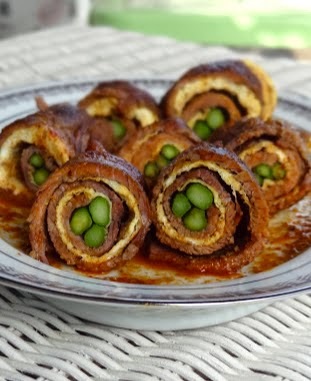 What I like about this "beef asparagus roulade" the colorful layered of the rolls ,thinly slice beef, layered with plain omelet and trimed asparagus and baked in Asian coconut sauce with Asian spices. This is the third time I made for our guests dinner, I serve with side of vegetables and spiced basmati rice or simple Fragrant rice. Roll, layered with plain omelet and trimed asparagus. Coated with coconut spices sauce and ready to bake. Cut the flank steak into thin fillet about 1/4 inch thick and 3 inches wide or if you can find really thin fillet steak that would be great. Rub with montreal steak seasoning. round omelet and set aside. and roll it, use toothpick to tighten up. place the beef rolls on top of sauce mixture,coated with the sauce. Bake into the oven for about 20 minutes and flip them and cook for another 20 minutes. or until cook or looks medium or medium well. 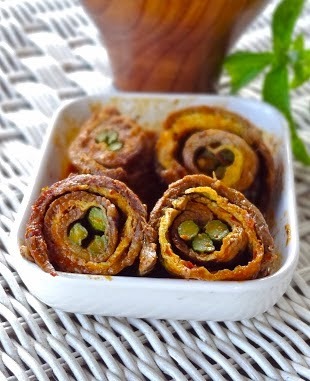 take out the tooth pick and slice the beef rolls and use the remaining sauce on the serving plate and place them on top. I admired the dish with the spiced up flavors. But I can't comment on the taste because I don't eat beef. That said, this recipe will be shared with my friends who will love it. It looks delicious and gourmet! 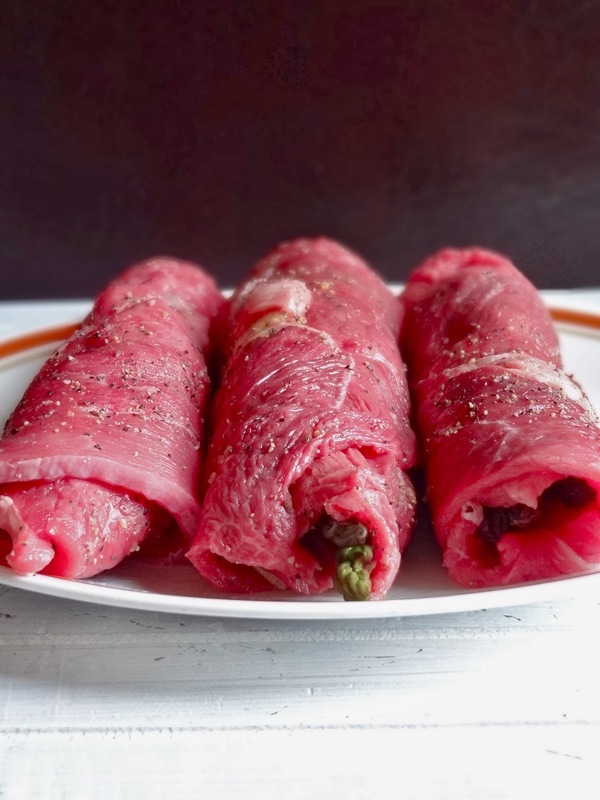 I'm admiring your pretty beef asparagus roulade... It looks not just pretty and sounds very delicious too with this flavorsome sauce. These are gorgeous, Ridwan! And they sound darn tasty, too! This is such a unique take on beef roulade. I love the Asian seaonings used and I can imagine how wonderful the whole dish tastes. Love your creativity with the roulade. The filling is so delicious and the presentation is gorgeous as well!